ELMO USA is coming to TCEA 2019! Visit us at Booth 1273 during this year’s Texas Computer Education Association (TCEA) Convention & Exposition at the Henry B. González Convention Center in San Antonio, TX from February 4th-8th, 2019. Stop by for daily raffle prizes, previews of new products for 2019, show swag, and more! We’re giving away not one but TWO major prizes on the show floor! Attendees have two chances to win an MX-1 bundle (includes our 4K portable MX-1 Visual Presenter and MX Writing Board) in daily raffles. Drawing times will be announced on the show floor so be sure to visit our booth to get your ticket. Be one of the first people to get an exclusive look at our upcoming products for 2019: the next generation of our PentaClass classroom voice enhancement system, our first ever Android document camera, and the AXIS Board interactive flat panel! Take a photo when you visit our booth and post it on Facebook or Twitter with the hashtag #ELMOTCEA19 and you could win a TT-L1 Document Camera! Visit our booth for more details. 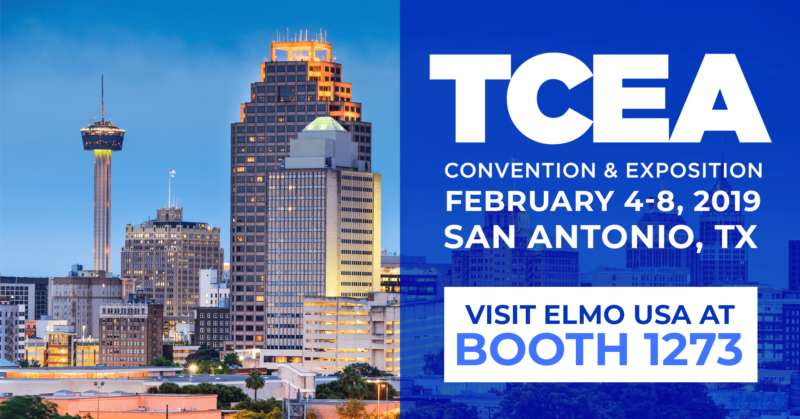 The first 10 attendees who visit our booth and show us they RSVPed to our TCEA 2019 Facebook event will win a FREE ELMO BLUETOOTH SPEAKER! RSVP on Facebook here.